Stonewood Grill and Tavern is literally a hop, skip and a jump away from my house yet, I can count the times I have been there on one hand. I’m not fully sure why we have eaten there so few times. On all occasions, the food has been good and fairly priced. While similar to an Outback, Stonewood has more of a quiet feeling towards it. I have always liked Stonewood and would have no problem visiting again. Over Christmas break when my grandparents were in town, we decided to go for dinner. After this visit, I really have no desire to go back. I called ahead to Stonewood and made a reservation. We arrived at our given time of 6:30pm and were seated right away. When our waiter came, I immediately got creeper vibes from him. He stared at Mommy basically the entire time and provided pretty poor service. We reviewed the menus and were ready to order but, our waiter took a while to actually come to our table and take our order. The odd thing was, he was only feet away from us, standing & starring in the other direction. 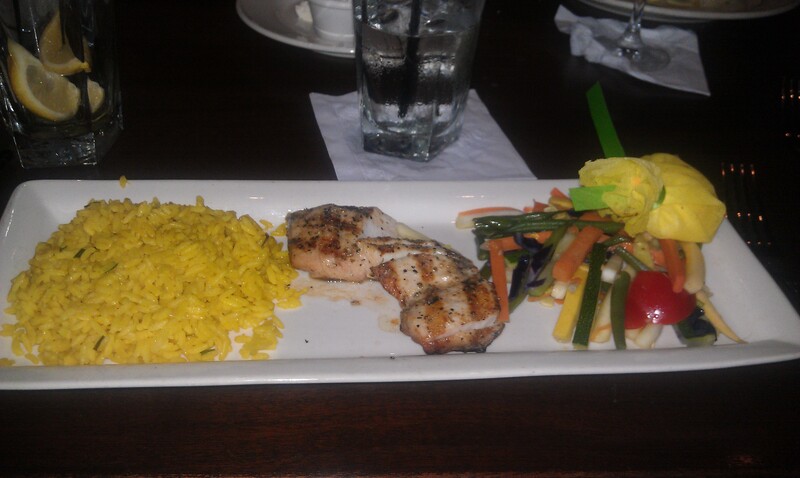 I ordered the half-portion of grilled mahi-mahi served with rice and grilled veggies. While I was very hungry, it seemed as if the prices had gone up a lot (from our last visit) which is why I opted for the half-portion of fish. I figured I would fill up on bread which I recalled to be quite good. 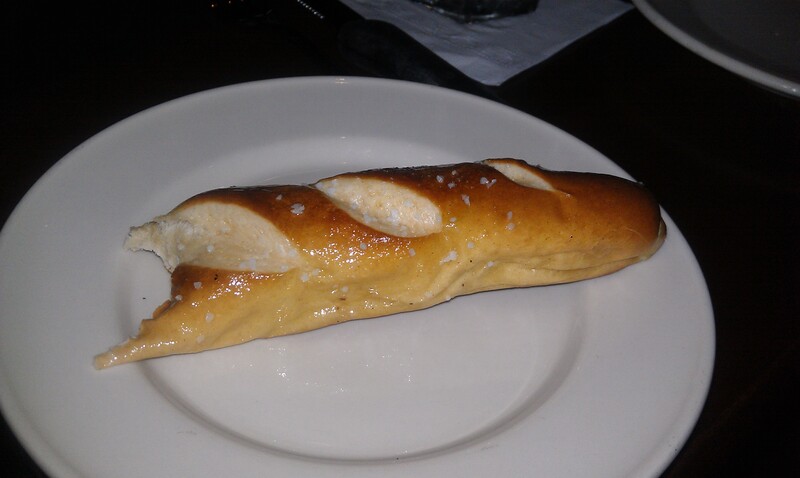 Creepy waiter brought over our bread and it was different than it had been before. You were now served bread sticks and mini-loaves. The bread sticks appeared to have a butter & salt coating and the mini-loaves looked to have herbs baked in. I first started with the bread sticks and was expecting them to taste like a soft pretzel stick. Sadly, they did not. The stick was warm yet overly buttered and lacking actual flavor. While the bread was cooked perfectly, it simply did not have any real flavor – besides the coating of butter & salt. The mini-loaves were the exact opposite – wayyyyy too much flavor. The herbs baked in overpowered the bread and made each bite taste like a mouth full of herbs. No mouths full of joy for me. Bread = fail. After waiting what seemed like a quite a while, our food arrived. The first thing I noticed was the pathetic portion of mahi-mahi that I received. I mean, this was not a half portion. This was maybe a quarter portion. You receive more mahi-mahi in one fish taco from Ale House then I had in my entire entrée at Stonewood. Really? Not only did you raise the prices but you decreased portion size that much? In the past, a full portion entrée of the mahi mahi would yield two, good sized pieces of fish. Now, I basically received one strip. I also noticed that the grilled veggies were much different. In the past, you received large pieces of veggies – fresh off the grill with visible grill marks. Now, I received shoestring pieces of veggies with no apparent grill marks. The rice looked like a small spoonful of just plain old rice. Nothing special looking here. I tried to be optimistic as I began to eat but it was indeed very hard to be so. I asked creepy waiter for some cocktail sauce and while I waited and waited, I started on my rice and veggies. 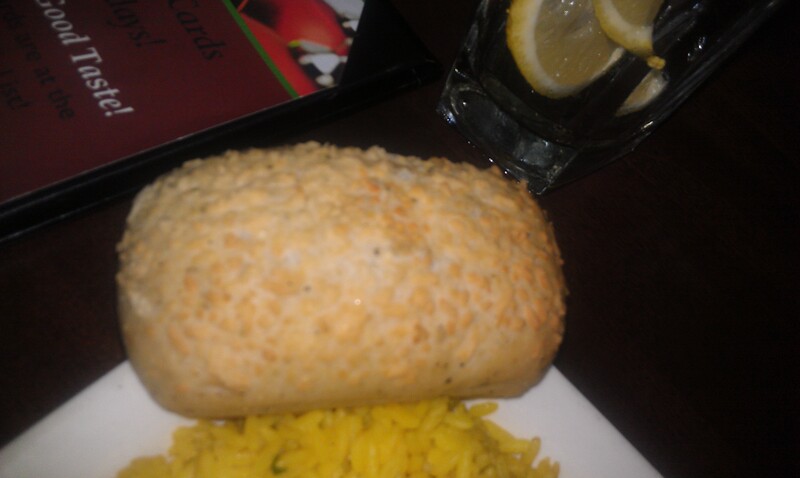 The rice was very bland. It really just tasted like rice with no seasoning whatsoever. It was fully cooked throughout – the one and only benefit of it. The veggies tasted as if the flavor has been blanched right out of them. I love raw veggies with nothing added to them. I feel like the veggies alone have plenty of flavors. Stonewoods veggies, had all the flavor taken out of them. They were overcooked, rubbery and totally flavorless veggies. If I was blindfolded and eating these veggies, I would of have had not the slightest idea as to what I was eating. I guess it’s better to have food with no flavor than food that is over seasoned? Either way, I was very disappointed in the taste of both the rice and veggies. When creepy waiter finally returned with my cocktail sauce, I began to slowly eat my small portion of mahi-mahi. The first thing I noticed is that it did not seem to be overcooked – a good thing for sure. I tasted the mahi-mahi and found its flavor to just be okay. Perhaps a bit salty. As I continued to eat, I used cocktail sauce with the fish and found its flavor to get increasingly salty. I can only contribute this to the sodium-filler it was in to preserve it. The fish did not have any grill flavor to it at all even though it was sporting some grill marks. After eating more and more of my tiny mahi-mahi portion, I realized that it was not cooked the same throughout. Some bites were cooked perfectly while other bites were somewhat undercooked and soggy. I cleared my plate at Stonewood (not that it was hard to) but was so under impressed with the food. Plain and simple, the food was just not good. From the bread & sides being over seasoned and flavorless to the pathetic portion of mahi-mahi, I really have no reason to ever go back again. I understand that prices need to go up with time but, you should not lose quality of the food with this increase. Beyond the fact that creepy waiter was creepy & slow, my water glass was constantly empty. Nothing bothers me more so than my drink being empty. For those of you who know me, I drink a ton of water. No water makes Nicki no happy. After this upsetting meal from Stonewood, I have no desire to ever return. A good dining experience cannot be achieved by serving poor food & providing poor service. I am glad that I was able to eat a few good meals from Stonewood in the past and really wish my last meal wouldn’t have left such a bad taste in my mouth. So rather than performing a simple hop, skip & jump to Stonewood next time we want to go out, I will be performing a hop, skip & jump far away…in the other direction.